What’s in your bag? is a recurring feature where we ask people to tell us a bit more about their everyday gadgets by opening their bags and hearts to us. This week, we’re featuring tech YouTuber MKBHD. Marques Brownlee’s tech videos are known for their sharp and polished look, and that extends to Brownlee and his studio, too. When we arrive, he’s already waiting to take us up to his studio, a spacious room with an array of neatly organized equipment. He even offers our video team some lights as they set up. 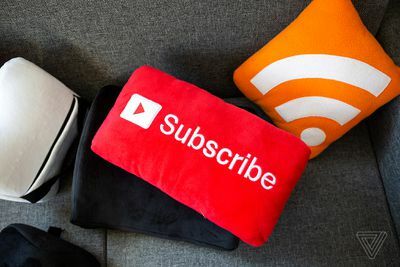 Brownlee started making YouTube videos in high school, and 10 years later, at the age of 25, his channel MKBHD is one of the most popular tech destinations on the site, with over 7 million subscribers and a billion total video views. 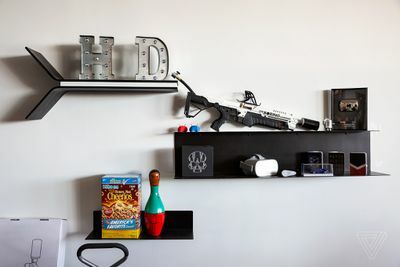 Every January, it’s a tradition for Brownlee (and the rest of the tech press) to head to Las Vegas for the Consumer Electronics Show, and we dropped by his studio in Kearny, New Jersey, to see how he’s getting ready. Brownlee opened up his bags to show us what he’s planning to take and what camera gear he brings to events. Brownlee’s essential shooting gear for CES, including the RED camera with modular parts and accessories, Microsoft Surface headphones, business cards, phones, and more. So why are there two bags, and why do you have everything separated? I typically have one backpack, my everyday carry. I don’t bring video gear with me everywhere. But when I do go to a show, something like CES or a new product announcement, something like that, I also bring my camera gear to make a video. That’s why there are two bags here. Cool. Let’s start with the camera bag. I’ll just start with the meat of it because that’s the exciting part. This is the camera with the monitor already attached. RED cameras, if you don’t already know, are very modular. You can attach a bunch of things, detach a bunch of things. It’s really hard to travel with the whole camera already assembled, so I don’t. The only things that are on it are the SSD reader, the camera mount, the Manfrotto plate, the battery module, the top handle, and the side handle. I’ve honed this setup, not only for travel, but just in general for when I shoot video. I’m very comfortable with this as it is, so that’s why I bring it. I love shooting with this camera. I feel like I almost owe a little bit of my style to how good the camera is at certain things. So, the RED camera, the Monstro sensor is amazing. How many batteries do you travel with? Four usually, yeah. If it’s a one-day thing, maybe two. 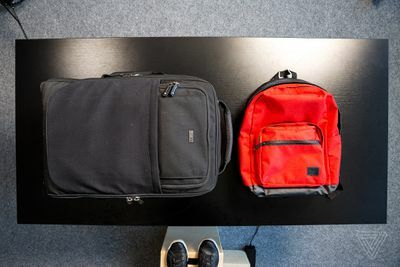 The Think Tank rolling camera bag and Herschel backpack that Brownlee uses at CES. The next thing would be to talk about lenses of choice. I have three lenses now. The 24-35. It’s a full-frame lens for the full-frame sensor. It’s wide. It’s f/2.0. It’s fast. It’s not stabilized, but this is the primary lens that I bring most places. It lets me get first-person shots. Lets me turn around and film myself. It’s great. It’s a Sigma. Kind of underrated, but they do really great stuff at really low prices. I can recommend this lens to people. This is a Zeiss Otus 55. Super sharp lens. It’s tighter, obviously, than 35. This is sort of midrange shots that are of things I’m not holding. Maybe someone in front of me is demonstrating something, but I just love the look that comes from this lens. It’s not the most practical. The minimum focus distance is much farther than these other two lenses, so I find myself a little bit limited by it. But when I can use it, I try to. And then last but not least is the Canon 100mm f/2.8L Macro. This is another awesome lens. Its minimum focus distance is very close. It’s 100mm, so this is getting super tight macro shots. Rounding out the top half of this bag is Sound Devices 633. It’s a mixer. It’s a recorder. 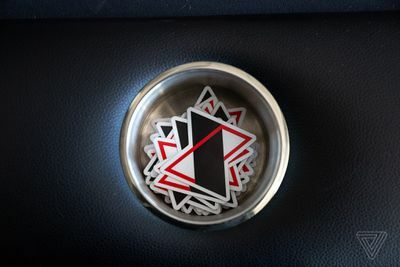 It’s a Swiss army knife of all things audio. Now, I don’t do audio on the show floor. I’m kind of notoriously never doing audio at events. It’s loud. It’s crowded. It’s another thing to think about. I’m focused on what I’m going to say later and sort of remembering what I’m going to say in my head as I’m shooting. I’m shooting for the editor because I’m the editor. But when I get back to the hotel room or a quieter room and pop the SD card in here, the mic plugs directly in, and this is all things audio. The batteries on the back are Sony. They recharge. They last months. I don’t think I remember the last time I recharged the pair of these, so these are great. Then last but not least, down here at the bottom, a red-and-black XLR cable — can’t go wrong there — and the mic, this is the Sennheiser MKH 416. And I actually never use the foam cover when I’m shooting or when I’m recording audio. I just put it in [the foam cover] to travel with because it’s just slightly fragile. A very expensive mic. So that rounds out the video gear. Do you have any secrets or tips or tricks for CES? My personal tip as far as what I do at CES is to not try to go as fast as possible. And for me, that means not doing audio on the show floor. It’s loud. People are elbowing past you. This happens at all kinds of tech events, but like, there’s no way to control all these variables. So if I just focus on video, on capturing all the things that I wanna show in video form, then I can take that footage back and sync up audio and do that later because audio doesn’t have to happen on the spot. So that’s my one tip: to actually take my time and differentiate it with some sort of quality since I know I won’t be first anyway. 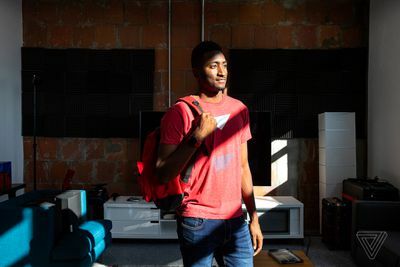 Brownlee carries a Herschel backpack and poses for a portrait in his New Jersey studio. Let’s move on to the other bag. So the Herschel bag. This is what’s with me usually. This makes its way to the hotel room. This is with me on the plane. This is my more everyday carry that sort of connects to the video gear. So first things first: the laptop is a 13-inch MacBook Pro. I don’t edit on laptops anymore. That’s a new thing for me, 2018–2019. So this is literally just a laptop to have a laptop, to do computer stuff. This is actually not the latest gen. This is the one-year-old MacBook Pro, but it gets the job done. Just emailing and doing all sorts of laptop things as you would expect on this, but you’ll catch me in the hotel room with an iMac Pro at CES this year because I refuse to deal with waiting for transcoding of RED stuff. That’s not in my bag, per se, but that’s why I just have a little 13-inch MacBook Pro. 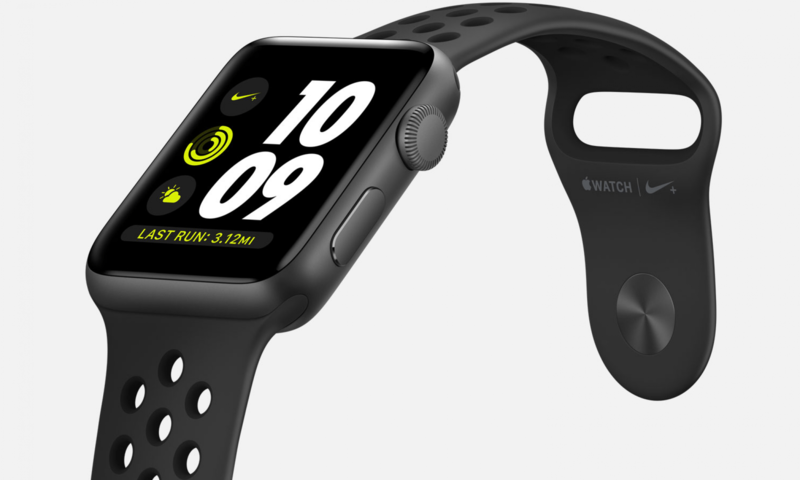 Next up is maybe my favorite piece of tech that came out this entire year. This is the 12.9-inch iPad Pro in the little folio case. Oftentimes, I’ll never take the laptop out of my bag because I can do pretty much everything that I would do on that on my iPad Pro. This is also the cellular one, so that’s catching up on YouTube. That’s Gmail. That’s watching videos. That’s all kinds of little light photo editing. So, iPad Pro, one of my favorite things. I really hope the new iPhone looks something like it next year. What do you use the most out of all these things? I would say out of everything that’s in my bag, because my phone’s not in my bag, [the iPad Pro] would be the piece of tech that I use the most. Until maybe a month ago, if you’d asked me what my headphones of choice were, I do not fly without my Bose QC35s. Then I found these [Surface Headphones]. These are better looking. These are more comfortable. These are lighter weight. These go totally over my ear instead of just on it. The noise cancellation is almost as good, which is fine for me, and the sound quality is great. They pair to multiple devices, so my iPad, my MacBook Pro, and my phone at the same time. They have a dial on the side for volume. They’re USB-C. There’s just so many better things about these headphones than the Bose. So until they update the Bose, I love my Surface Headphones. They go with me every time I fly. Then actually, up here in the little top corner of my bag, there’s a little microfiber pouch — one of my favorite features of this backpack — I have my AirPods. They’re matte black. What else do you have in there? I have, if it’s still in here… yes, it is. I have a SIM card ejector tool everywhere I go. It’s probably not a normal thing to have, but as a guy who’s moving between phones often, I kind of have to have one. Razor included this one in their box. It’s great. And then in the front, this is just with me out of habit, but I have a small Sharpie, a little notebook. Chances of me actually writing things down in this notebook are extremely small because I have my phone with me anyway, but you can never really go without paper at some point, write something down. And some business cards. They’re with me wherever I go. And in this last pouch over here, I have a Lightning cable. I have this little Swiss army knife, this USB-C and full-size USB card reader. It reads SD cards and microSD cards. So on one side, it’s a full-size USB. Pop that down, Micro USB. Open that up, USB-C. This thing’s awesome. If you ever need to read a media card on something that doesn’t have a card reader — which is most things now — this is great. This is made by… I don’t know how to say that. Vanja? Van-ja. Van-jaaa. Are there any non-tech items in your bag? The only non-tech item I think I have — because, like I said, it’s all necessities — would be my extra contact lenses. Without contacts, I’m almost blind. It only took me missing one flight to go back and get contact lenses for me to just now put them in every conceivable place that I travel. So they’re in my backpack. There are more in my suitcase. There are more in my duffel bag. They’re just around, so I will never not have my contacts. I don’t really carry that much non-tech, to be honest. Most of what I enjoy doing when I’m not in production mode is just messing around with my computer or my iPad or something, so that’s pretty much all I carry. And that’s it. 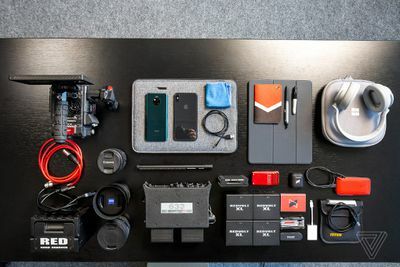 That is what’s in my gear bag and my everyday bag when I’m traveling, when I’m doing tech things, when I’m at CES. This is what comes with me. 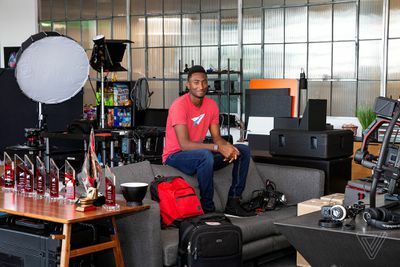 MKBHD poses for a portrait in his New Jersey studio.